Before the last peg was removed dismantling the marquee in the Falls Park where Féile an Phobail aficionados of all ages danced and sang the week away; before the last word was spoken at the more than 50 political events on its programme; before the exhausted staff of organisers got time to sit down, take a breath and applaud themselves on a job well done, plans were being laid for the biggest and best Féile for August 2013. Next August Féile an Phobail celebrates its silver jubilee, its 25th anniversary, and organisers are hoping to mark the special occasion with a memorable Féile25. The year Féile started, 1988, was the year I was released from the H-Blocks where I had been imprisoned for six years. The days immediately after my release, in mid-February, were a shocking reintroduction to life on the outside amidst the conflict. Two IRA men, Brendan Burns and Brendan Moley, died in a premature explosion in south Armagh.Three unarmed IRA members were killed in Gibraltar by the SAS and another was killed by the British army in west Belfast. At the funerals of the Gibraltar Three a loyalist, armed with weapons secured by British intelligence, killed three mourners, including an IRA member. At his funeral two plain-clothes, armed British soldiers in an unmarked car drove at speed at mourners, who thought it was another loyalist attack. They were stopped, overpowered and killed by the IRA. The mourners’ and media’s immediate perception was that this was another mass murder attempt. The scenes were frightening and graphic British and unionist politicians and the media twisted the incident around and dubbed the people of west Belfast “savages”. Out of this tragedy and the demonising of the people of west Belfast the MP for the area Gerry Adams and others organised a morale-raising festival, hosted around August 9 to displace bonfires and attacks from the RUC and British army, with the aim of showing the creative and progressive and welcoming nature of the community. There were street parties and a modest carnival period aimed at children. There were concerts and dances and, of course, what became characteristic of the Féile, distinguishing it from other festivals, were its candid political debates, discussions and lectures. Its primary focus was a ‘festival of the people’, hence Féile an Phobail. It eventually evolved into Ireland’s largest community festival attracting thousands of tourists and big names to its gigs each August. Since the Good Friday Agreement it has played an important role in bridge-building across the various divides and in welcoming in the ‘new Irish’, those from other races and ethnic backgrounds who have come here to live and raise their families. Its bilingual -- Irish and English -- menu of debates feature unionists, former British soldiers, former IRA prisoners, prominent politicians and campaigning groups. Subjects covered include everything from history to conflict resolution, truth and reconciliation and the rights of victims. Guests have included President Mary McAleese, Seamus Heaney, Michael Moore, Tim Robbins, Bob Fisk, Martin Sheen and scores of others. Féile provides a platform for people to raise issues of concern about the society we live in and what type of society we want to live in. Arguments put forward in a variety of discussions last week included those from unionists and loyalists that the union was the most beneficial arrangement for the people of Felle provides a platform lor people to raise issues of concern about the society we live in and what type of society we want to live in. Arguments put forward in a variety of discussions last week included those from unionists and loyalists that the union was the most beneficial arrangement for the people of the north. On the other hand, not surprisingly given the culture and the community in which the festival was born, others argued for an inclusive, peaceful, united Irish society where all races and minorities would be welcome and protected in law; where equality between men and women was a reality, where minorities like Travellers and gay people would be respected; where a free press did not mean a privileged press for the elite; where freedom was not just national but international and where economic equality not the needs of the wealthy was the pillar of the economy. 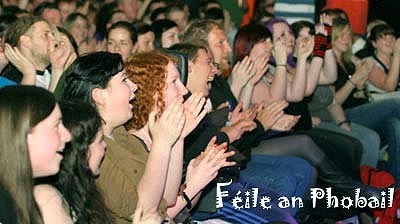 Féile provides not just the biggest summer school in Ireland but brings joy and fun to its host community and well beyond with its concerts, dances and comedy nights. Féile planners are an ambitious lot. That is why you can bet Féile25 will live up to expectations.